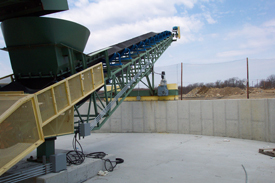 Belt conveyors are designed for the best possible use and are low maintenance. In fact, every part of the chassis is drawn and laser cut for an unsurpassed degree of precision and assembly. We offer two main types of conveyors: apron conveyors (also referred to as slider beds) and roller conveyors (also referred to as idlers). For apron conveyors, the belt slides over a steel plate instead of being supported by rollers. All design norms meet CEMA standards. Conveyors are available with a multitude of optional items according to your needs: belt cleaner, screw or gravity take-up, self-cleaning tail pulley, integrated scale, self-supporting body, round or square gallery, top covers and bottom pans, etc. All our designs meet basic OSHA standards. The type of belt selected for your application depends on several factors: type of material, required capacity, type of conveyor, head and tail pulleys, etc. The belt selected for your application is critical to avoid premature wear. Conveyors are available in different widths, based on the type of material handled or the quantity of material to be transported.